St. Thomas Aquinas, Please Pray For Me. | The Size of a Mustard Seed. Matthew 17:20. St. Thomas Aquinas, Please Pray For Me. It’s that time of the year again. That time that every single student absolutely dreads. When you are so totally done with school, but you know that it is when you should be the most focused. Term papers are waiting to be written, homework waiting to be made up, and finals to prepare for. But even being a good student and knowing that these things all deserve your undivided attention, you still cannot seem to get yourself to focus. Sometimes you are even on the brink of not caring. Okay anyway, this recent diagnosis has now hindered the things I love. Like my blogging. So in honor of this increasing yet almost-finished-with schoolwork, I decided to look to the patron saint of students. St. Thomas Aquinas. Saint Thomas Aquinas was incredible. He had this impressive determination in God’s will. Nothing would shake his faith and trust in God. St. Thomas, born in 1226, quickly excelled above all the rest in both his studies and virtue. So in other words, he was never affected by this end of the year syndrome. Instead, he saw the grace and beauty in his studies which we all aim to see. This was a spark of God in his studies. This passion he had for learning lead him to find that God was calling him to enter the Dominican Community. Although, his family was greatly against this decision. Saying that they were not supportive would be a major understatement. 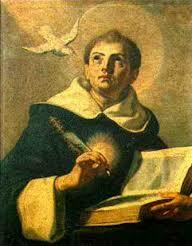 Aquinas did not care, he knew this was his calling, so he went right ahead and entered at the age of seventeen. His family was not going to give up though. They too had much determination within them, but they were using it against their son. In their efforts to see their saintly Thomas leave religious life, they tried everything in the book for over two years. They went terribly far to reach their goal, even sending their son an impure women as a temptation. But St. Thomas persevered in his calling. He was not going to allow anything to stop him from following our Lord’s will for his life. By the grace of God this saintly scholar made it to his profession of vows. Following this he was sent to study under the praised St. Albert the Great. Here, his fellow students found ways to poke fun at Aquinas. He was nicknamed the “dumb ox” because of his silent manner and huge stature. Don’t let this name foul you though, he was the brightest out of the group. Theology was second nature to him, and he absorbed all the information like a sponge. At the young age of twenty-two he was given his first job as a teacher, where he also began writing his first works. When he was ordained to the sacred priesthood, he was then sent to Paris. At the remarkably early age of thirty-one, he received his doctorate. It is during this time that we meet our saintly-friend-group once again. He was known to frequently dine with no other than the saintly King, Louis IX. This was an honored and much loved friendship. Soon, Pope St. Urban IV called him to teach in Rome, and Aquinas humbly declined. He instead composed some of his greatest works and preached with incredible efficaciousness. His greatest work, although it went unfinished, is his Summa Theologica. It is here were we see this young men’s influential insight to theology. To this day he is still regarded as one of the greatest theologians of all time. As incredible as this is, to me this shows much about the way God’s grace works. Yes, St. Thomas Aquinas was born as a very gifted student. And yes, he worked very hard. But there had to be a great amount of grace in his life for him to be able to have reached the pinnacle of knowledge he had at the time of his death in 1274. We not only see grace at work here but also an exemplary response to this grace. He was literally determined to grab a hold of everything that God was blessing him with. He knew that we couldn’t just sit around. In this, Aquinas shows us what another great saint, St. Augustine wrote; “God provides the wind, but man must raise the sail”. So let us pray to St. Thomas Aquinas. For his determination and trust in God’s will and grace. For his love of learning and finding our Lord in knowledge. To have the same aim toward God which he always had. And of course, for him to help all students in their end of the year slump.